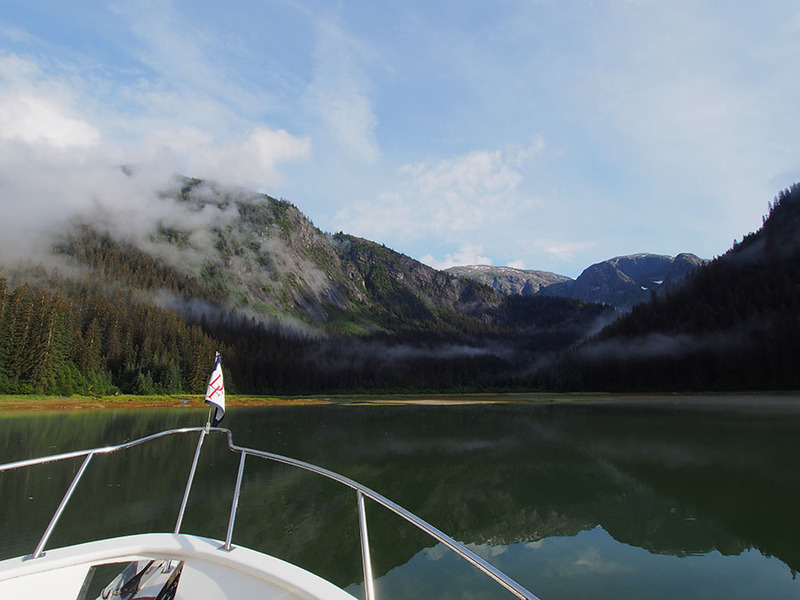 Just south of Tracy Arm fjord is another arm off Holkham Bay called Endicott Arm. Among the features in this long arm is the aptly named Ford’s Terror – a very narrow, steep fjord with an entrance that’s a bit challenging. As you can see on the chart, there is a very tight pinch point full of rocks (indicated by asterisks). 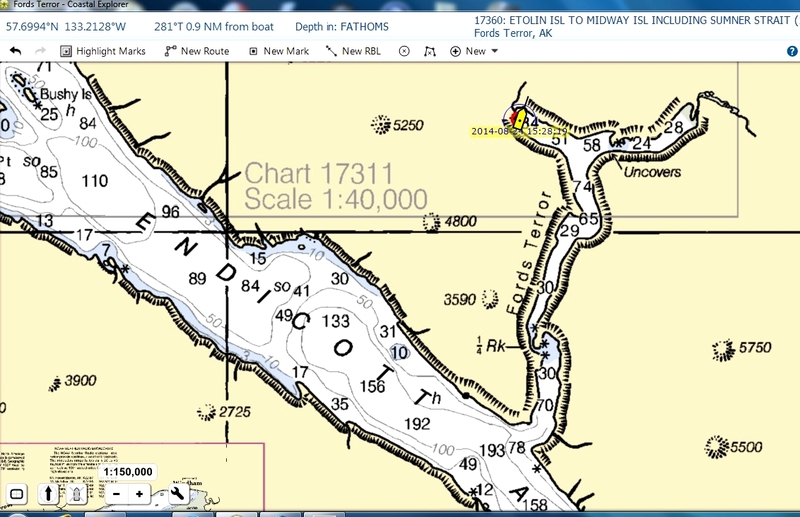 This chart is the most detailed available for the fjord, and note that depths are in fathoms (6′ = 1 fathom). 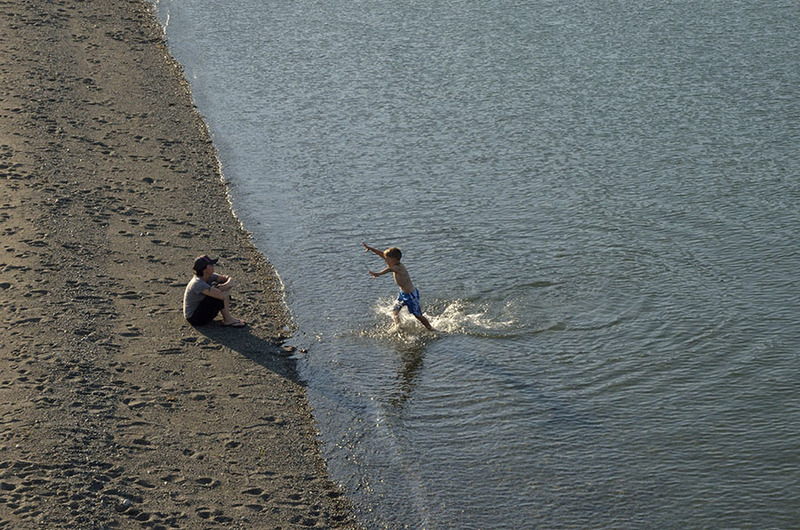 In addition to the poor chart and rocks, that pinch point becomes a nasty rapid when the tidal current is running – people come to surf on the standing waves. The night before we made the transit I was wondering why we were going to go in there (“Robin’s terror!”), but other people have done it successfully and we had some points of reference from the blog of a very respected training captain from Seattle. 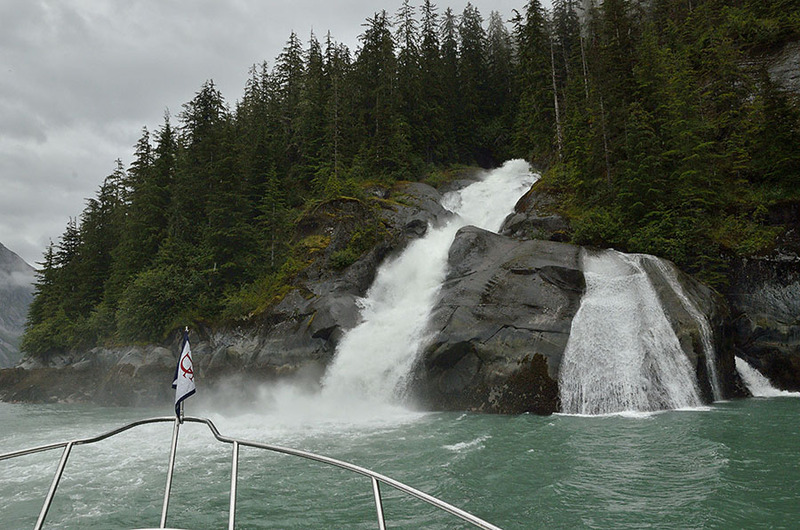 We cruised up to the entrance keeping an eye on the time so we would arrive at slack current after high tide, cruised close to the big double-waterfall, and turned to look for the rock reefs that line each side of the narrow channel. We called a “Securitay” on the radio in case any boats were trying to exit – there is room for only one boat in the pinch and no visibility due to the blind corner. 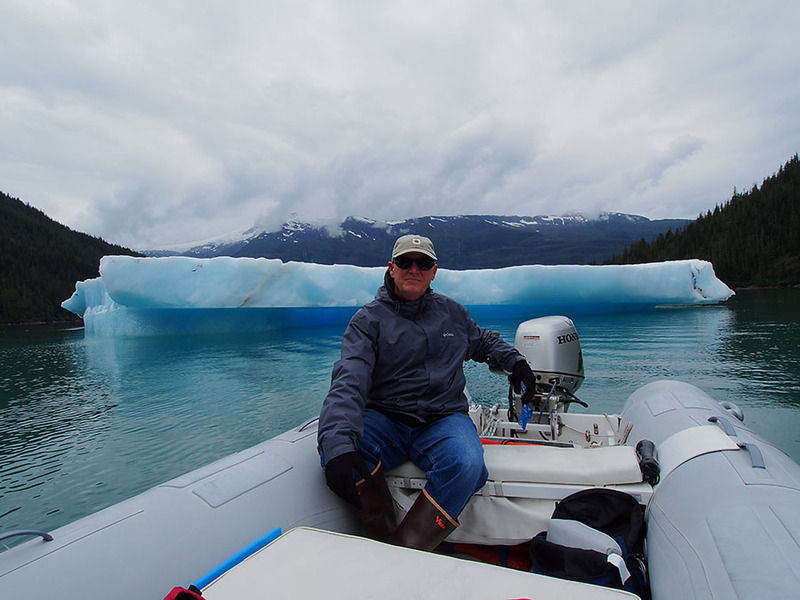 Fortunately I could see the rock reefs under the water pretty well, but we had to stop the boat and nudge a chunk of glacier ice out of the way in the narrow part. After some nervous moments we made it through and began to appreciate why this place is so special. 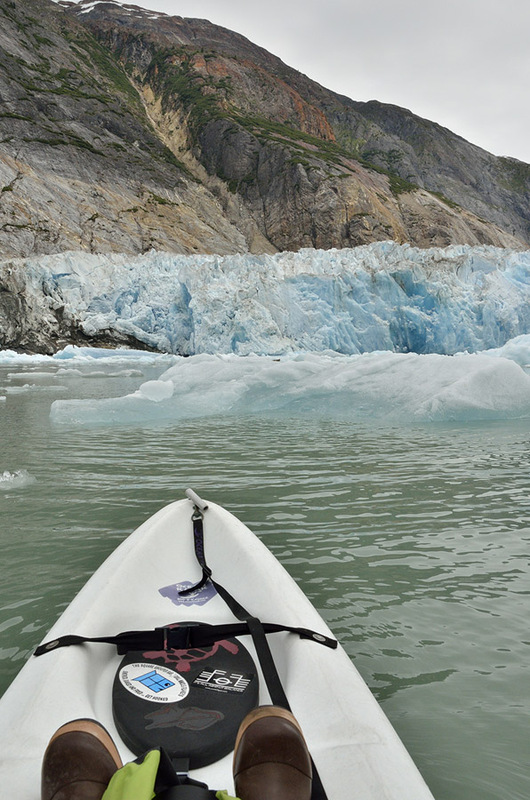 The fjord walls are steep and the channel is close – it’s so dramatic and gorgeous! I think it’s one of the most beautiful places I’ve ever been. The best part is that we had the fjord all to ourselves for two glorious nights. We just sat and soaked in the beauty, I kayaked, and we explored in the dinghy. In addition to several big flashy waterfalls, we watched a mother black bear and her two cubs prowling the meadow in front of the bow all day long. See the little red circle in the photo above? 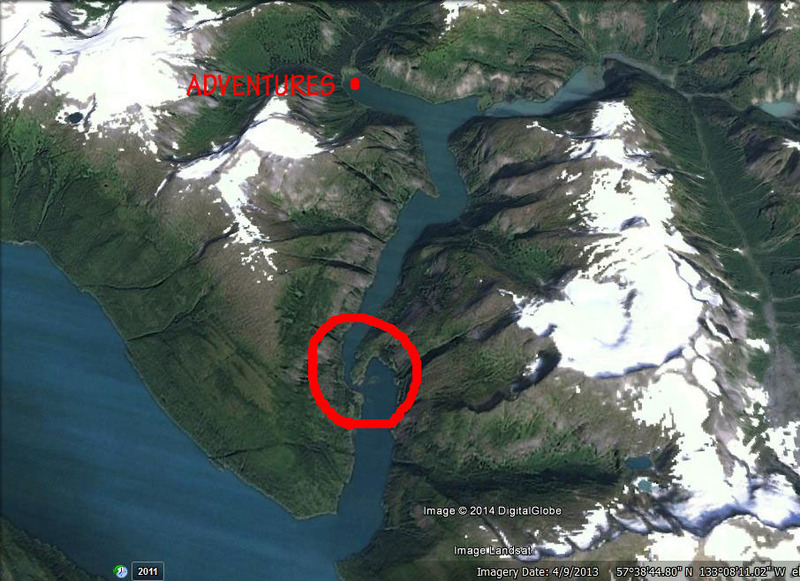 That’s ADVENTURES anchored in the west arm of the fjord. 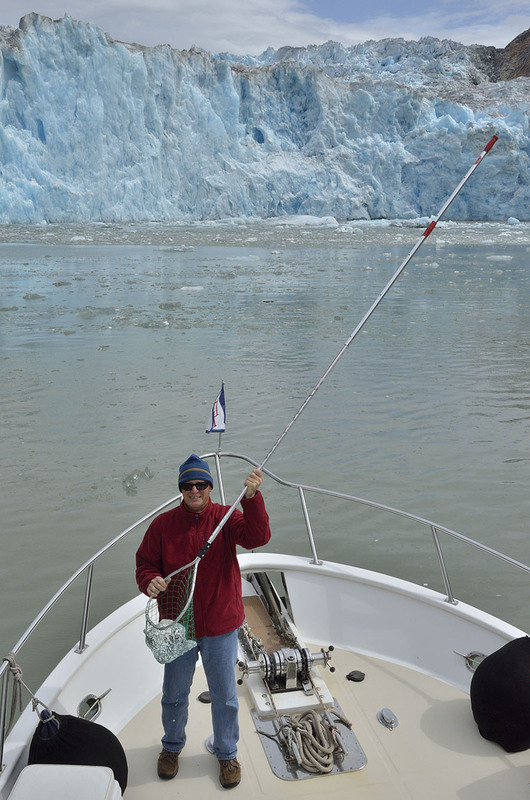 When we took the dink to explore we decided to head out the narrow channel to get some better bearings for running the entrance, and we found a huge chunk of iceberg probably aground, though it was so big we couldn’t tell for certain. Note the small rock embedded in the ice on the far left. 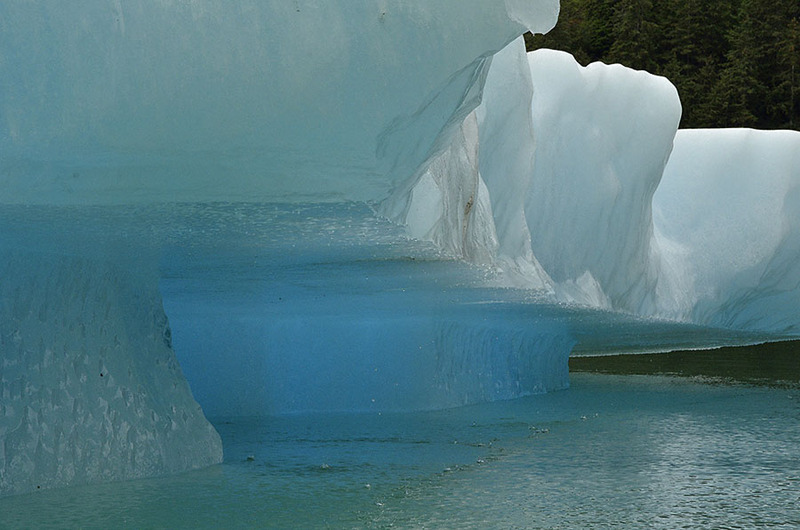 Glaciers pick up all kinds of things and transport them great distances. The blue glow was eerie, and the color almost fake! So why is such a magnificent place named “Ford’s Terror”? Apparently a fellow named Ford was crew on a survey ship around 1899, and he was either sent in to explore the fjord or he decided to go in to hunt, but the bottom line is that he and his row boat were trapped inside by the vicious current until the tide turned and it scared him more than a little. The trip was well worth the “terror”, and we will definitely return again. 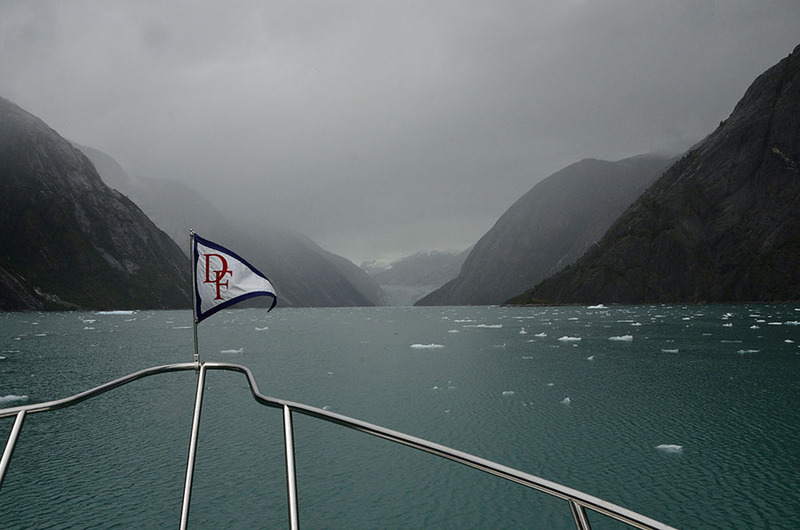 After we reluctantly left the fjord we headed farther up Endicott Arm to see the Dawes glacier, but we weren’t able to get very close because the water was choked with brash ice. It was a misty, gloomy day, but at least we could see the glacier from a distance and it had a great moody feeling from the weather. We got closer than the photo shows, but not much. 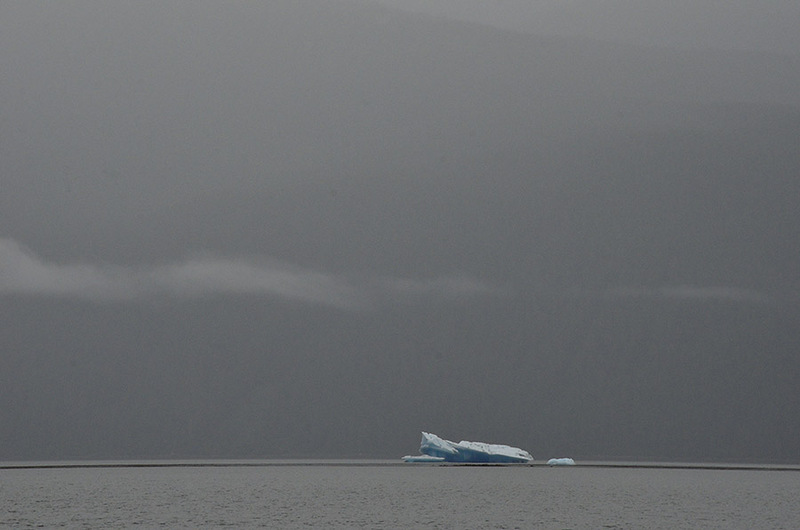 We cruised back down the Arm to anchor, and I loved how the blue bergy bits stood out against the gray misty mountains. 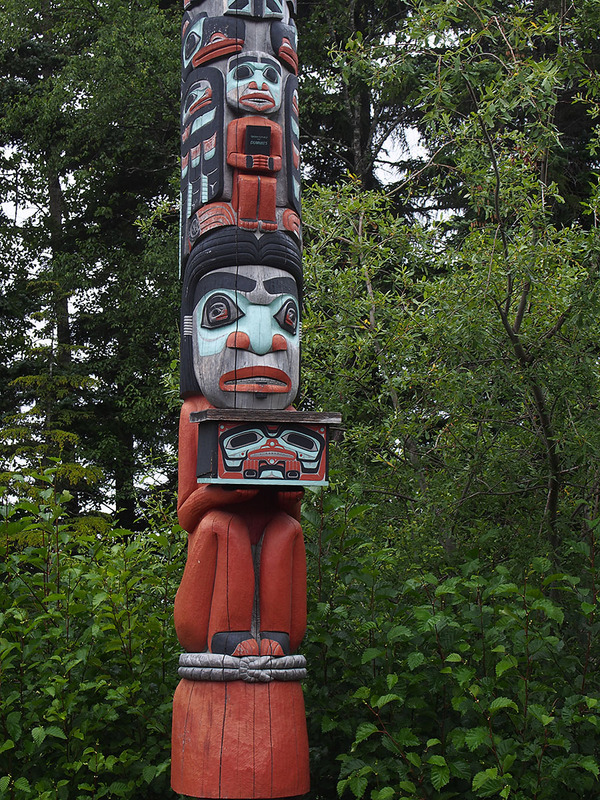 After our adventures in the only two towns with a road that actually goes somewhere, we headed back to Juneau for a quick overnight – we needed some plumbing parts, and we were able to hop on the bus, walk a bit, and get what we needed without too much fuss. 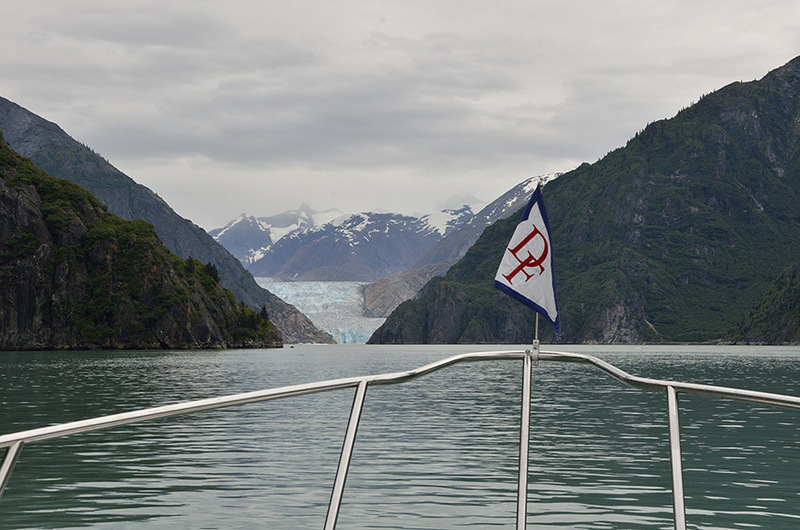 From there we headed to new territory south of Juneau – Tracy Arm, which is a fjord with a 90 degree turn and two glaciers at its head. 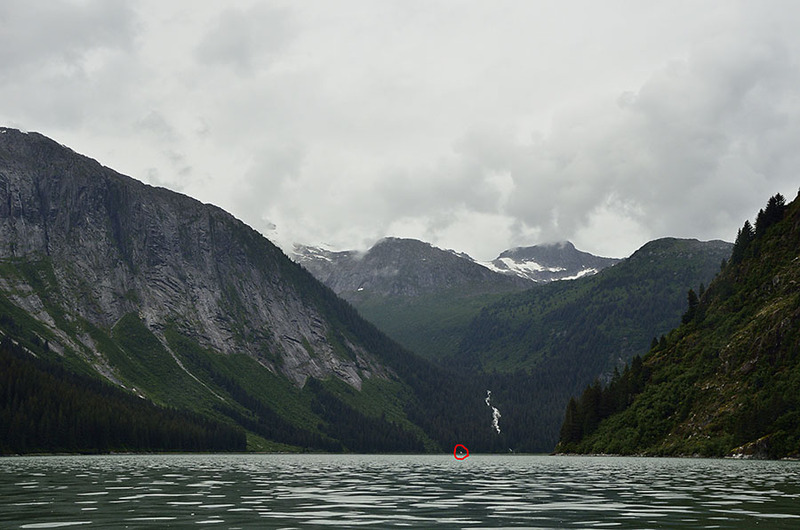 As we got closer, we started seeing good-sized bergy bits in the water, and we had to cross a bar that was created by the glacier sometime in the distant past, when it was more than 50 miles longer. 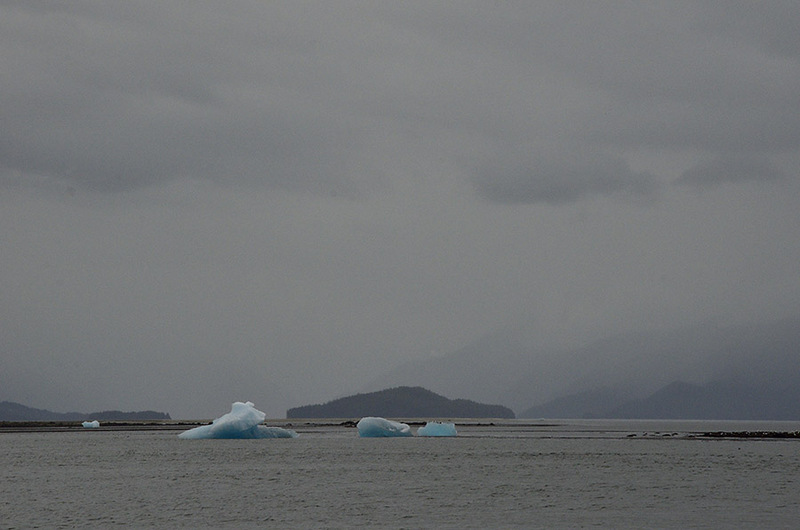 Some of the bigger bergy bits run aground on the shallow bar, and we were amazed at how very blue they were. 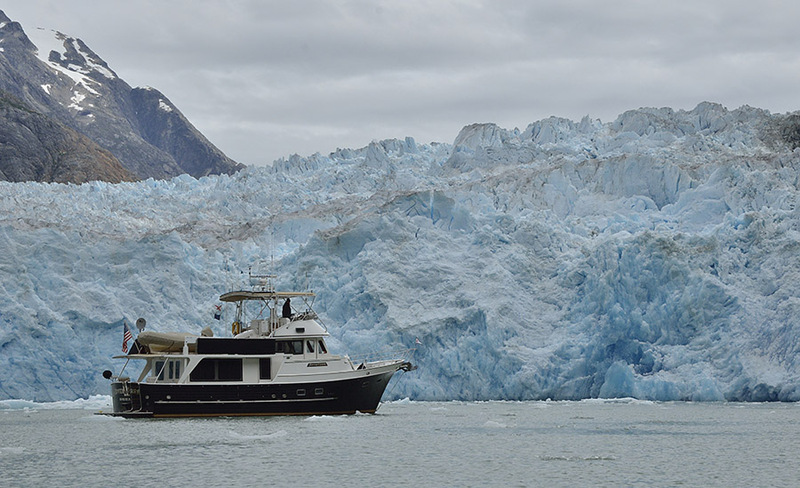 The trip up Tracy Arm is just beautiful, though it’s easy to get too focused on the glaciers up at the end. All along the way there are waterfalls and sheer walls, and we loved investigating them, up close and personal. The weather wasn’t always the nicest, but even some drizzle and fog made the landscape look beautiful. Along the sides of the fjord we sometimes saw smaller valleys with the classic “U” shape that indicates it was carved by a glacier. 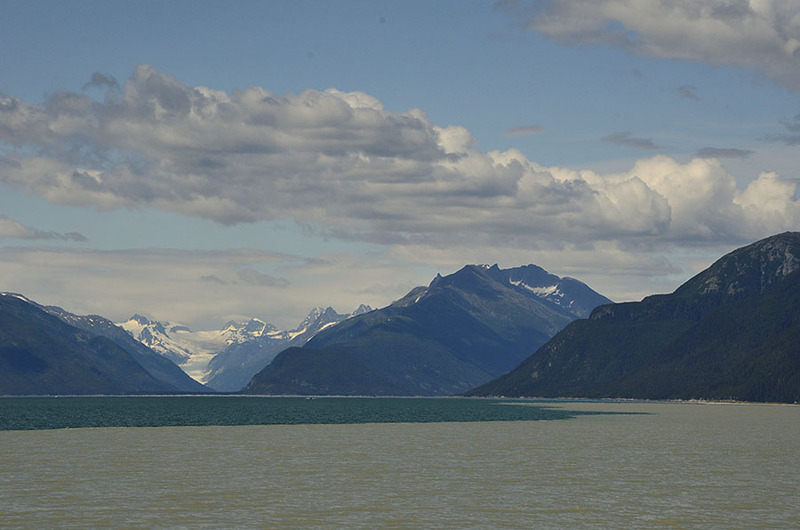 The highlight at the far end of the fjord were the two glaciers – Sawyer and South Sawyer. We headed up to see the smaller north Sawyer glacier first, and were excited to see all the blue ice, even on a dreary day. 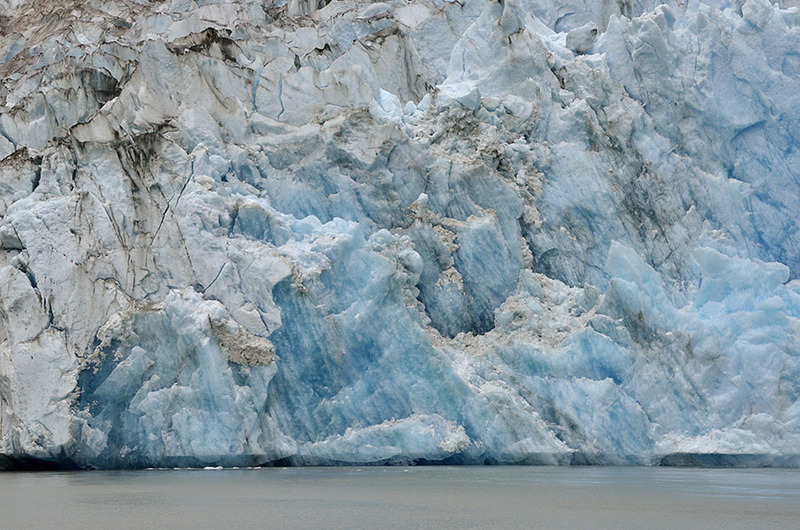 The view of the South Sawyer glacier was a bit more dramatic – it was visible at a greater distance. 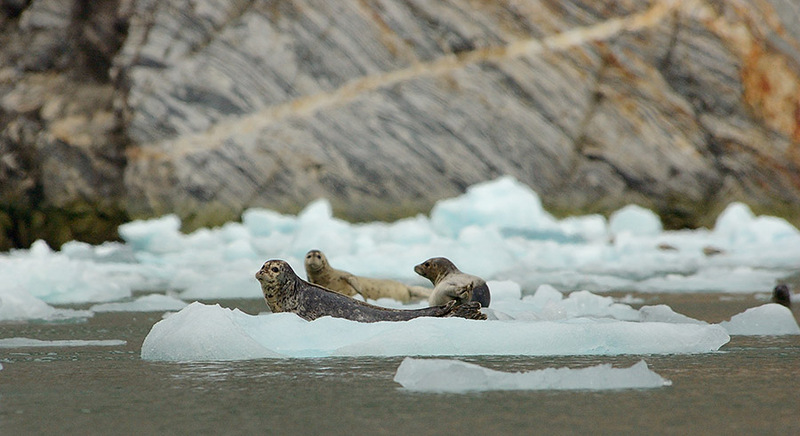 Not only was this glacier bigger and more beautiful, it played host to a large population of seals hanging out on the ice calved from the glacier. 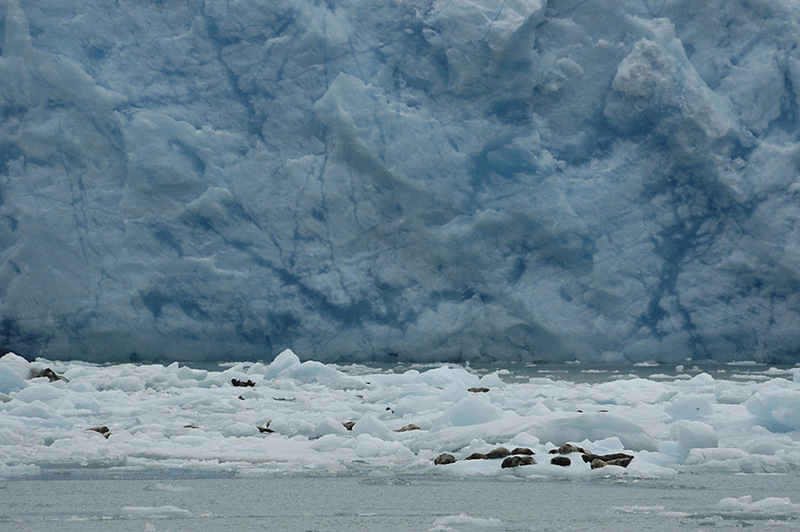 What’s more interesting – the glacier or the seals?? It’s a tough call, but we dropped a kayak in the water so I could get closer to them while Jim kept ADVENTURES away from the biggest bergy bits. 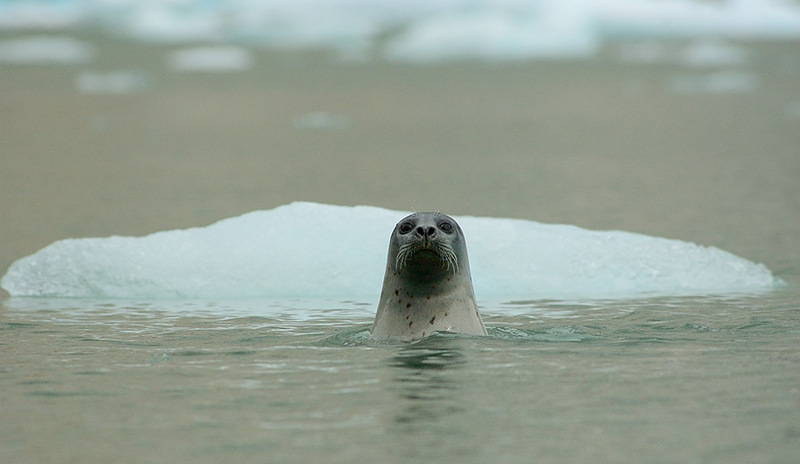 We had radios so we could talk to each other, and Jim kept me posted about the little gang of curious seals that were following me, and popping up to watch. 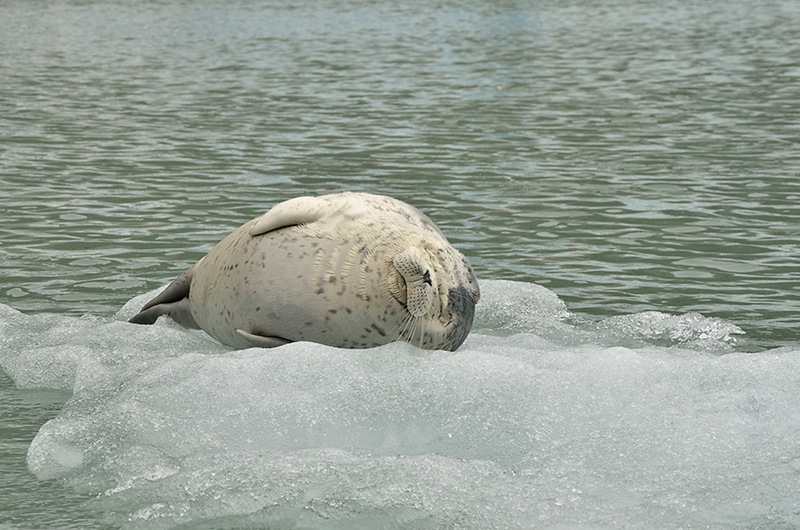 My favorite was this little seal that was fast asleep on the ice. 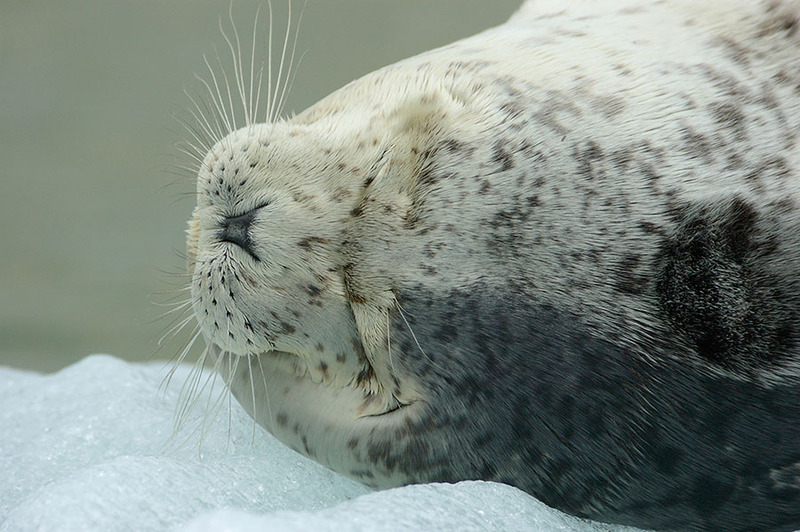 He looked like a fat sausage… It was fun to watch him until he finally woke up and looked at me with sleepy eyes. I paddled farther away when he woke up, and when I looked back he was returning to his nap. 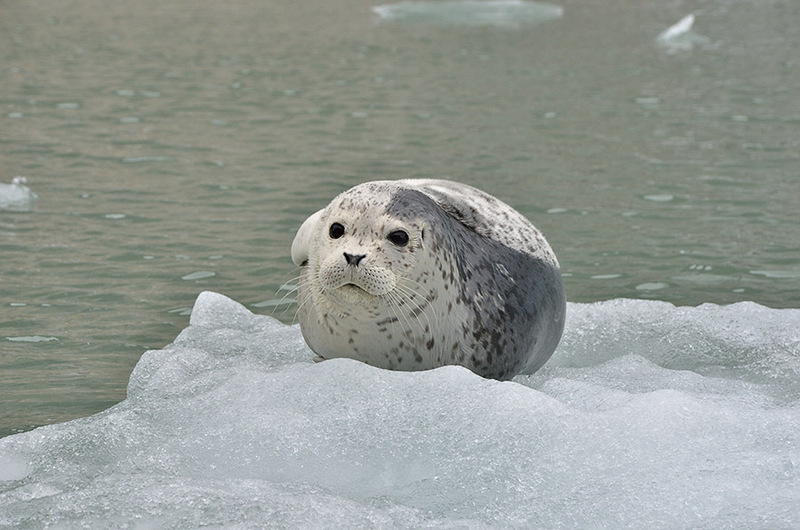 All the seals were curious and kept an eye on me, and I had fun watching them and seeing the wide variation of their coloring. Before we left the glacier we had to scoop up a bit of the super-clear, dense ice – it keeps drinks cold longer, and it’s just neat to drink ice formed from snow that fell about 200 years ago. If you remember from my last post we were in the far northeast corner of Alaska’s panhandle in the town of Haines, and it’s one of only two places in SE Alaska (the panhandle) with a road that goes anywhere. All the other towns are land-locked either by impassable mountains or because they’re on an island so cars have to be brought in by ferry. The road from Haines goes into Canada, and if you turn east on the Alaskan Highway you can pass through Whitehorse (Canada) and back into Alaska to the town of Skagway. It’s a 350 mile trip by road… or 16 miles by water. Thankfully the big Alaska State Ferry runs between the two towns to carry cars, trucks and RVs. 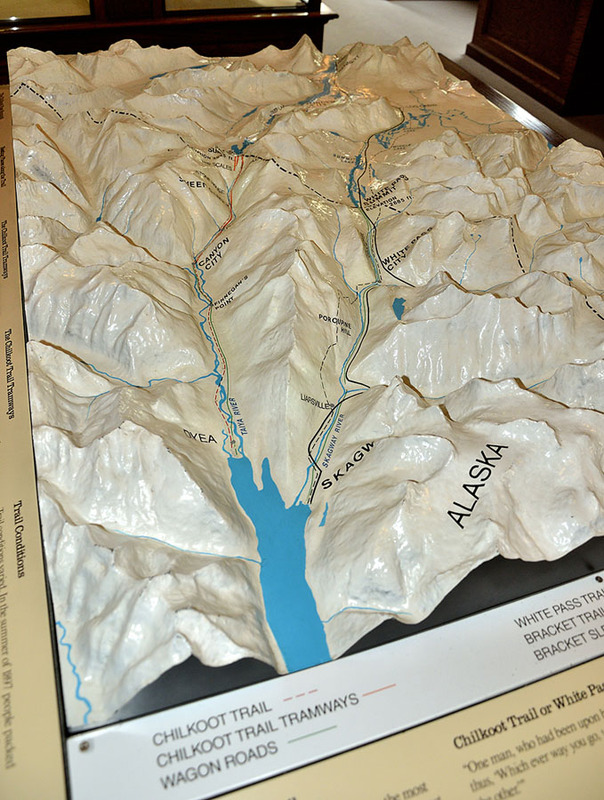 This is a nice 3-D map from the National Park Service showing the steep mountains leading up from the port of Skagway. 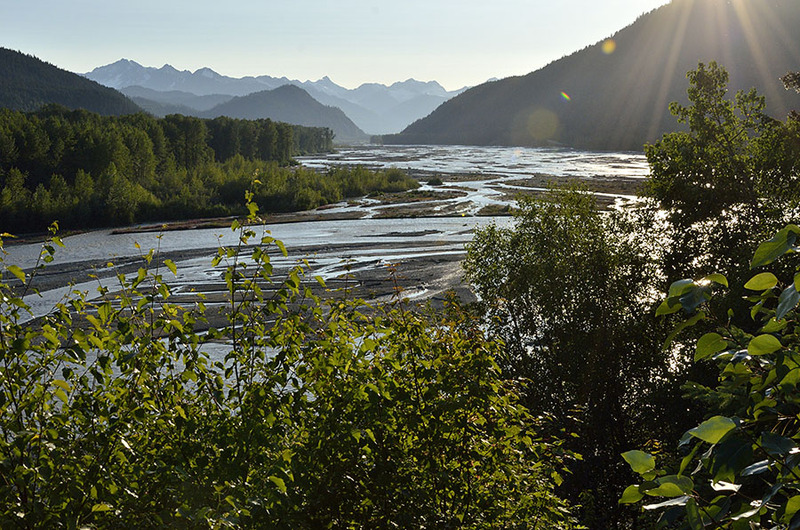 This is Klondike Gold Rush country – the primary point where the stampeders came to cross the mountains to get to the Klondike River in Canada to seek their fortunes. In this map you can see the two trail options used by the stampeders – the Chilkoot Trail (steeper but shorter) is on the left and the White Pass Trail is on the right. The Gold Rush started around 1898 and only lasted a couple of years, and because of all the excitement some investors built a railroad along the White Pass Trail, though it was completed after the Gold Rush died down. 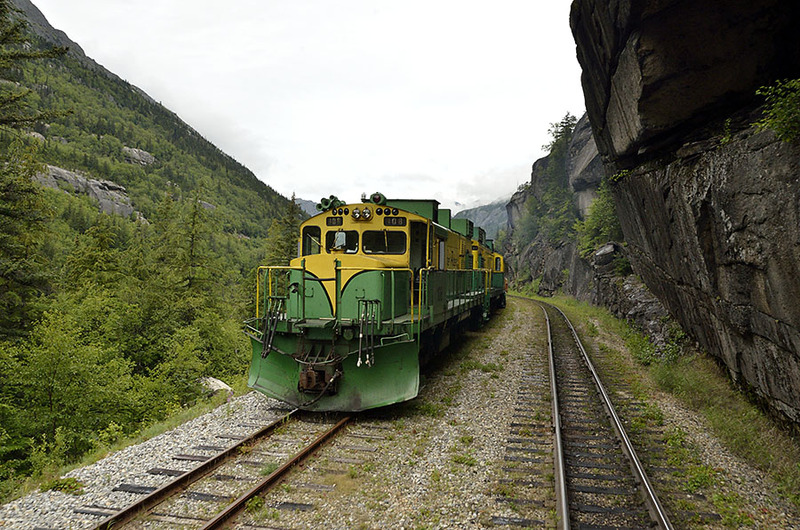 The railroad still exists, though it’s now used only to carry tourists from Skagway up to the Canadian border at the top of White Pass – a beautiful ride through the mountains. Notice the small snow plow on the front of the engine. 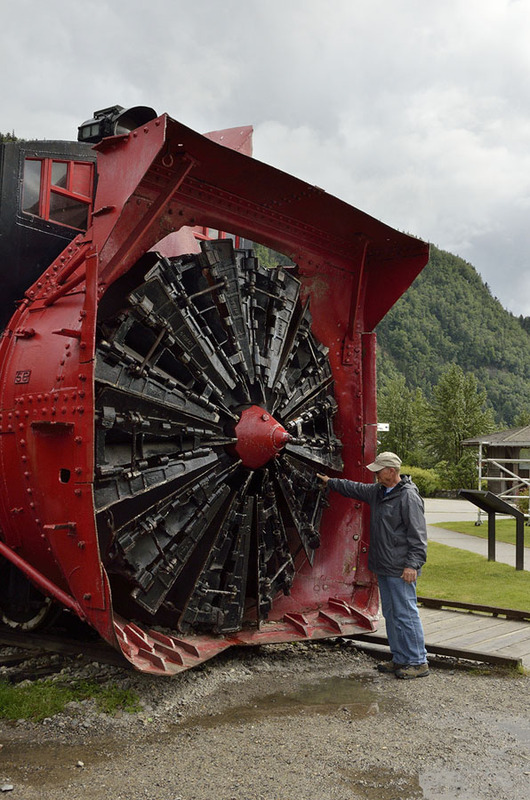 This part of SE Alaska gets a lot of snow in the winter, and they need a much bigger plow to really clear the tracks… like this rotary plow. Skagway is very touristy since it hosts up to 4 massive cruise ships per day, but the history is nicely preserved in town and the National Park Service does a great job with some interpretive movies and walking tours. Too many cruise ship crowds wore us down a bit and we had some mail on the way so we headed back down to nearby Haines. 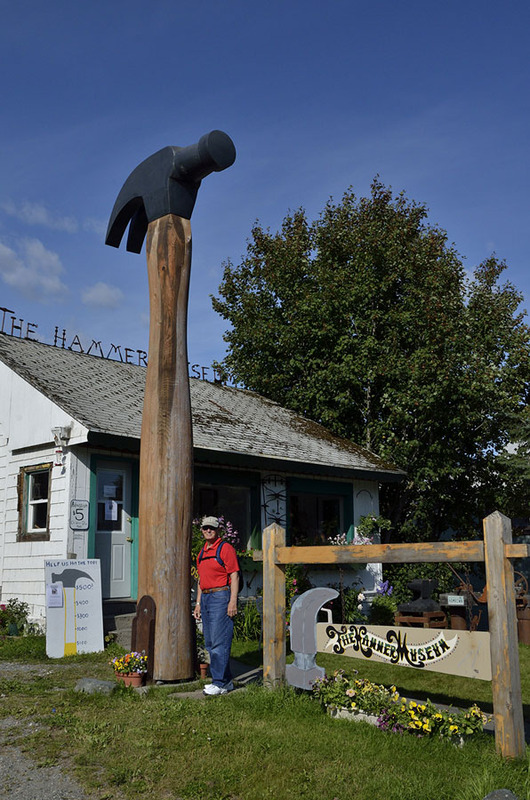 The timing worked out well since the SE Alaska State Fair is hosted in Haines and would be starting in a few days, plus we still had a few Haines highlights to see, such as the Hammer Museum. 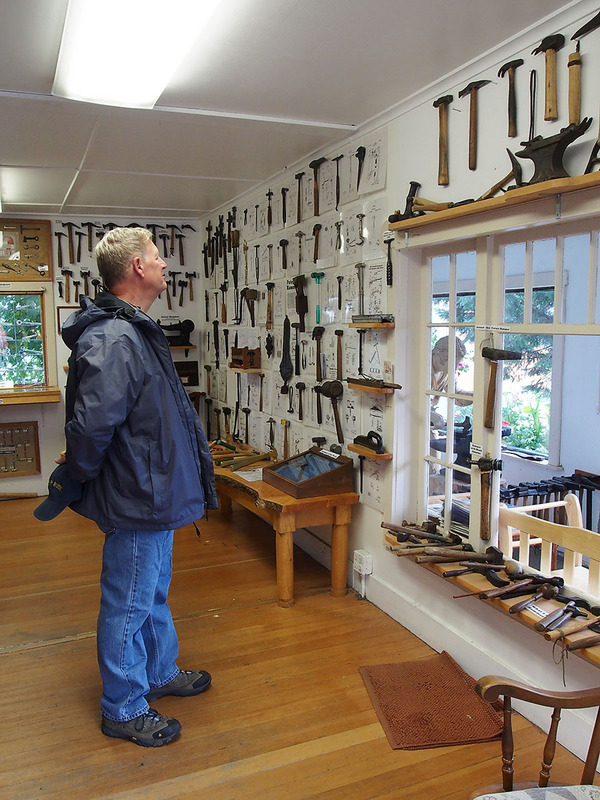 Yes, a museum devoted to hammers. You can’t make this stuff up. We had to check out the totem pole at the town’s library, with a bookworm, a man holding the “box of knowledge”, and if you look very closely at the guy above holding a book – the book’s title is “Totem Carving for Dummies”. 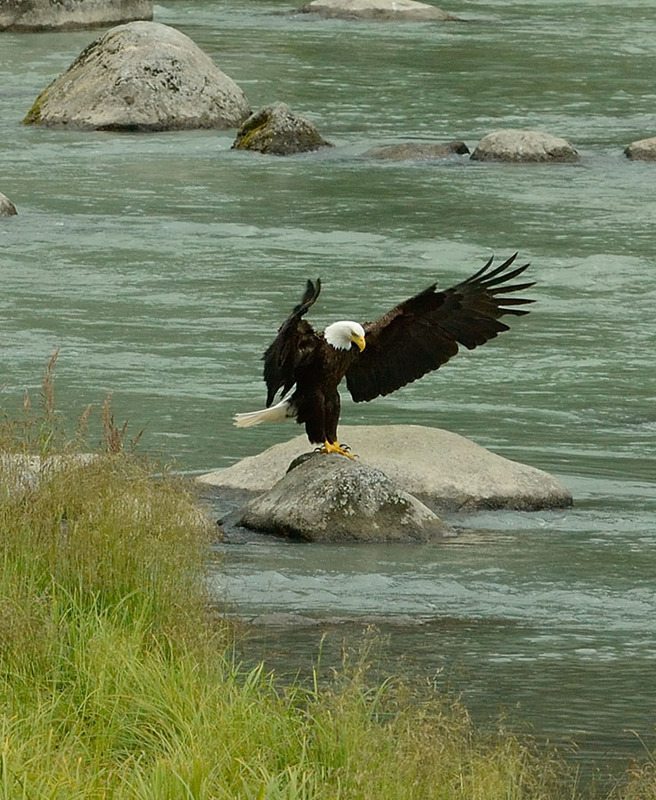 Haines is known for the largest concentration of bald eagles anywhere in the world, particularly over the winter. About 4000 eagles congregate around the Chilkat River, and there is an Eagle Festival in the Fall and a lot of serious birders coming at other times of the year to see them. 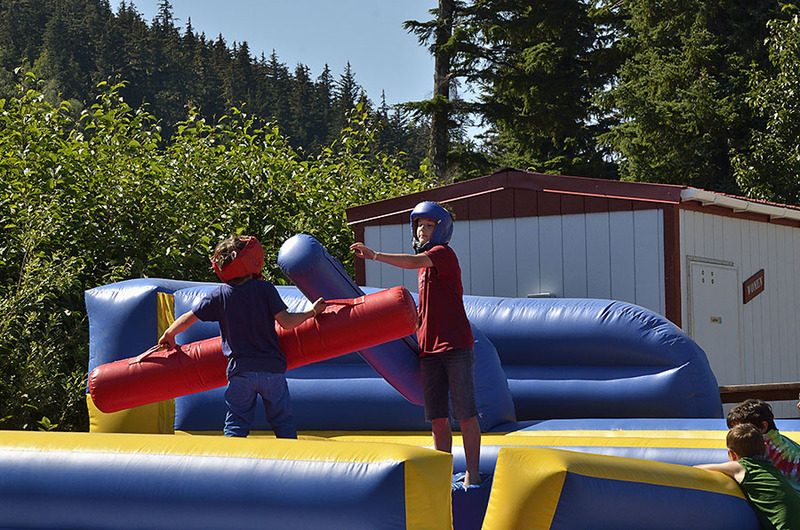 We capped off a nice second visit to Haines with a day at the SE Alaska State Fair. It was much smaller than we expected, but the various arts on display were excellent, and the flowers and vegetables were huge (thanks to all the rain and long hours of sunshine). We had a great talk with the gal from the National Weather Service – near and dear to a boater’s heart, and we enjoyed watching these kids duke it out. We really need to get some of these helmets and padded battering rams for the boat… a healthy way to deal with living in close quarters, I think. There were bands and performers playing all through the day and well into the evening, and many people came from other parts of SE Alaska to cheer for their favorite entertainers. 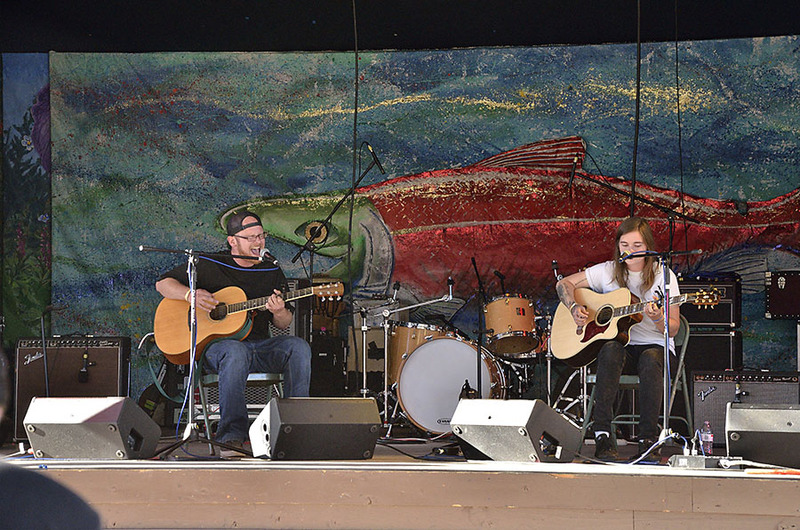 Notice the backdrop on the Fair’s stage – a sockeye salmon in spawning colors. Around here, it’s all about the salmon. 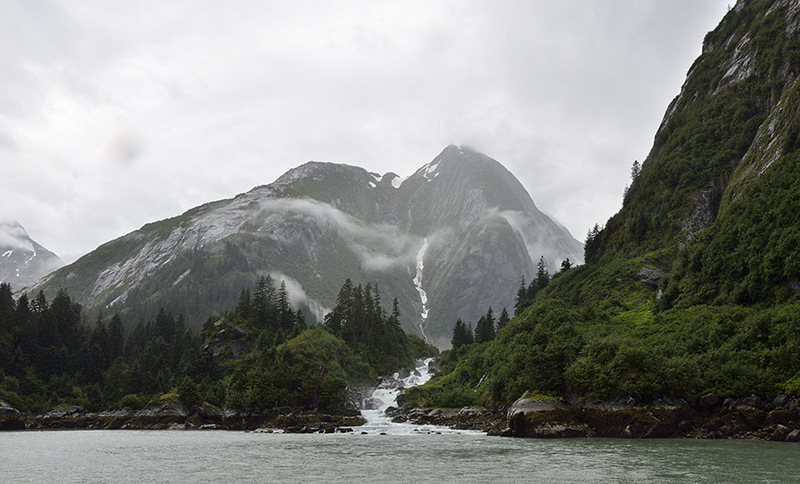 It was a relief to escape from the Big City atmosphere of Juneau and head north up the long, straight Lynn Canal towards Haines and Skagway. 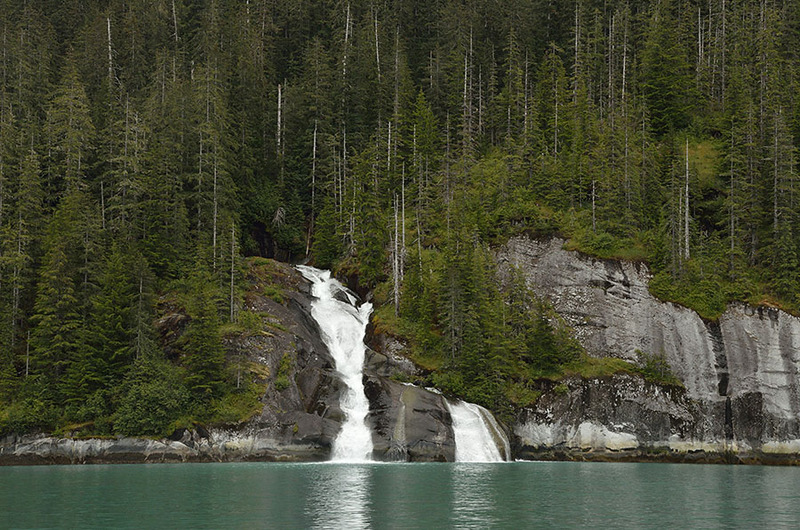 If you look at a map of SE Alaska (the “panhandle”), the biggest long stretch of water is Chatham Strait which becomes Lynn Canal north of the Juneau area. Geologically this long stretch of water is actually a continuation of the San Andreas fault down in California. 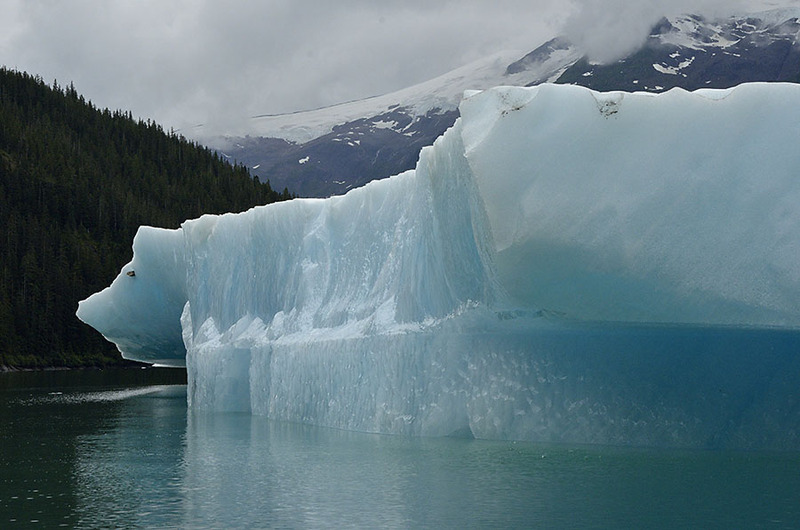 Lynn Canal is a disappointing name for a beautiful 6 mile wide waterway with tall mountains capped by snow and hanging glaciers along both sides. 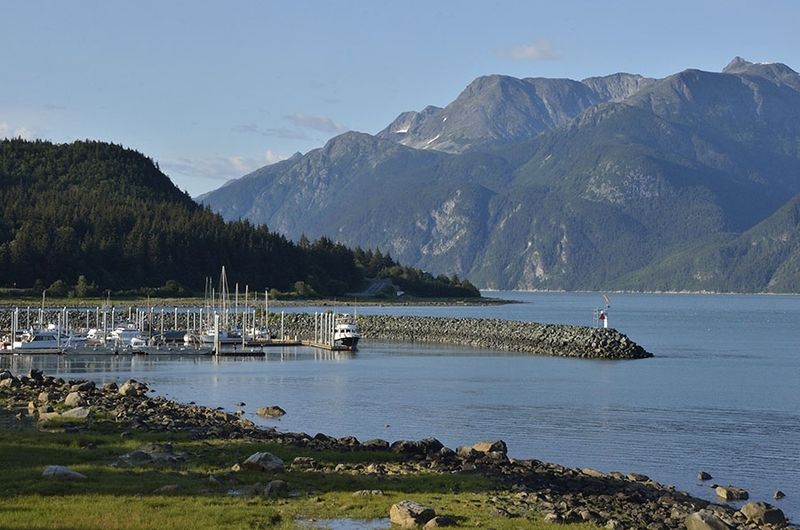 The little towns of Haines and Skagway are not often visited by cruising boats since they are about 65 miles from Juneau, with nothing in between. The canal has a tendency to get strong winds funneling along its length, so it’s important to watch the forecasts. 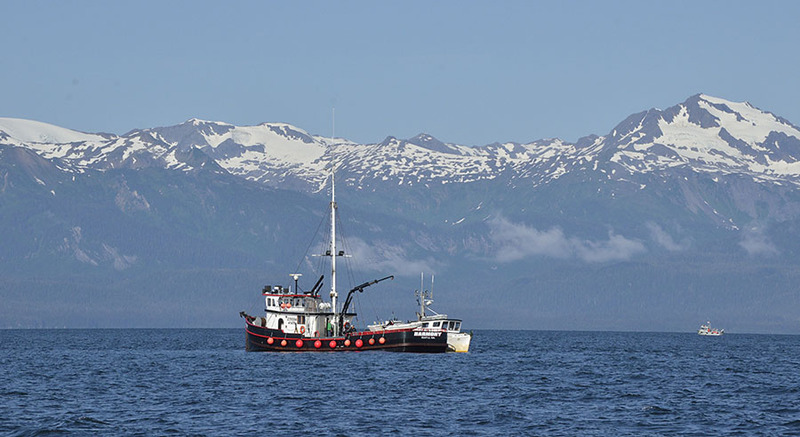 We had a beautiful day for the trip north, though we had to keep a sharp eye out for gillnetters – 40-ish’ commercial fishing boats each with 1800′ of net strung across the water. The net can be hard to see unless you’re pretty close to it. 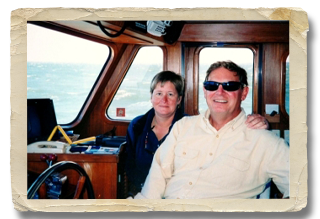 We didn’t realize that a window for commercial fishing had just opened, and we had to do a bit of zig-zagging to avoid all the nets. If you look closely in the photo below you can see all the little white dots – those are gillnetters up ahead and each one has its own net to avoid. 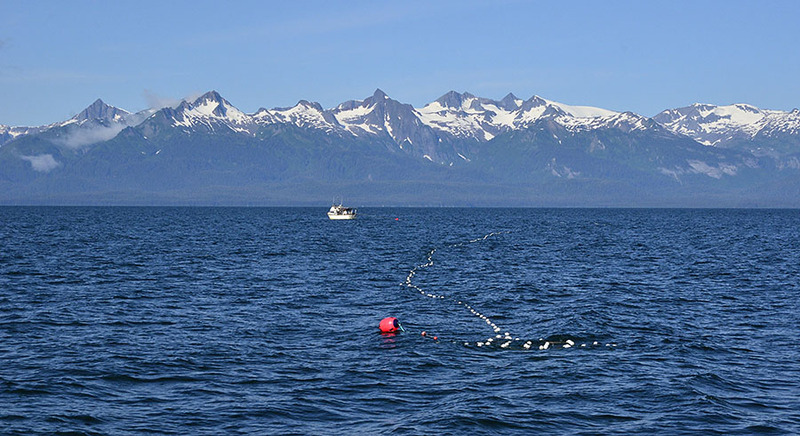 Since the gillnet boats are relatively small they don’t have the capacity to hold a lot of fish. Stationed nearby are much larger “buy boats”, and the gillnetters zip over to the buy boats to offload their catch before going back out for another set of the net. It was very interesting to learn more about this type of salmon fishing, and the fishermen were friendly and very willing to explain things to us. As we got farther north the canal narrowed and we encountered the strange effect of a glacial river meeting the salt water. The river carried a lot of putty colored silt from the glacial moraine, and there was quite a striking line where the waters met. Note the glacier in the background – there were a number all around us in the mountains. Haines was the opposite of Juneau, and we really liked it. The people were very friendly and the town marina was terrific. They offered us the commercial price for fuel so we filled the boat. The town was down-to-earth and friendly, and it only gets one cruise ship per week so it has a nicer balance of tourism and fishing unlike some of the other towns that are overrun with ships every day. We loved watching the local people just enjoying a summer day, despite the fact that the water temp was in the high 40s. (!) 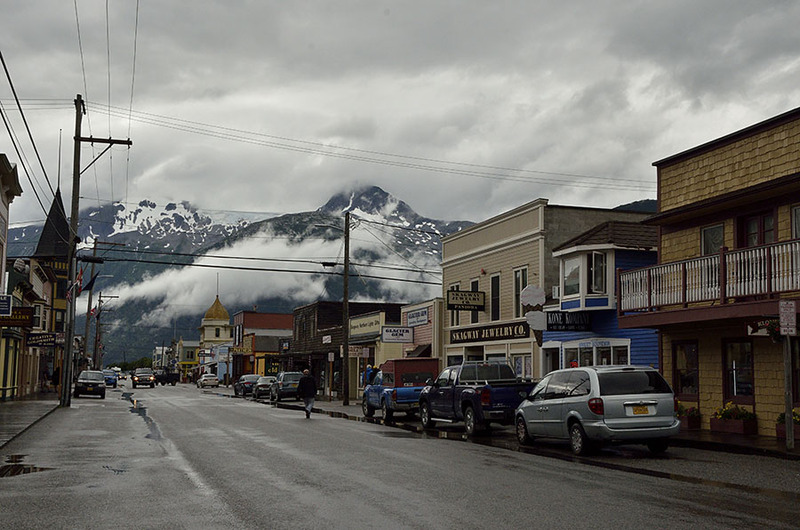 What makes Haines and Skagway different from all the other towns in Southeast Alaska is that they have a road that leads somewhere. 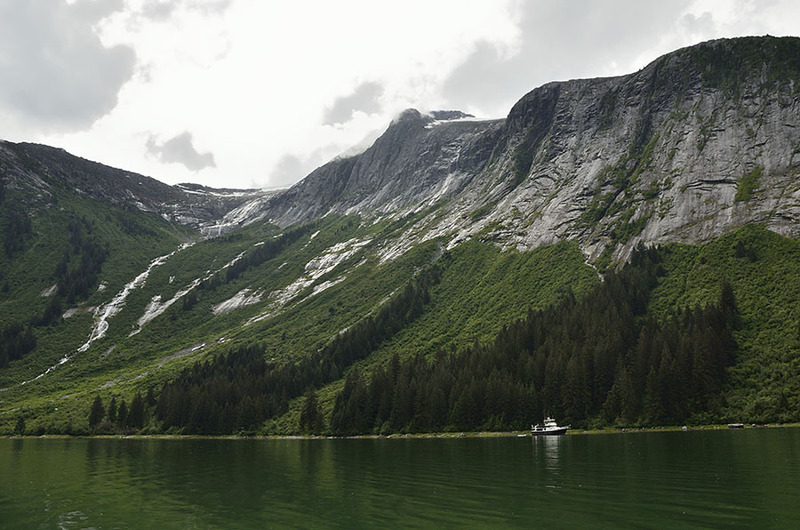 Even Juneau, the state capital, is landlocked and only accessible by boat or plane. 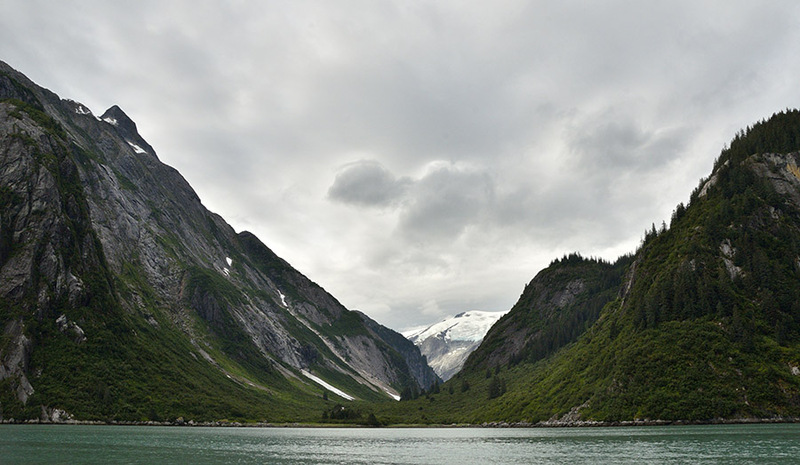 With the road, Haines and Skagway get visitors by RV as well as a number of Canadians who keep boats here. 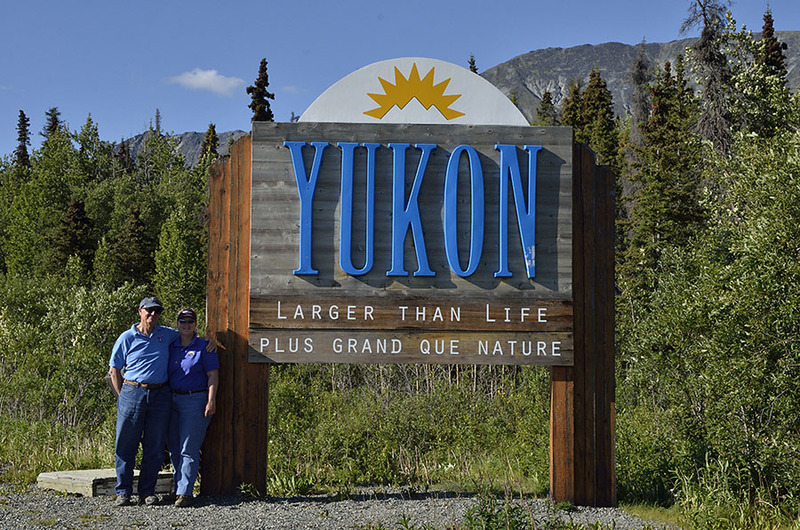 With the proximity of a road to explore and the promise of a warm sunny day (after a few weeks of too much rain), we decided to rent a car, grab our passports, and venture up into Canada’s Yukon Territory for a day. 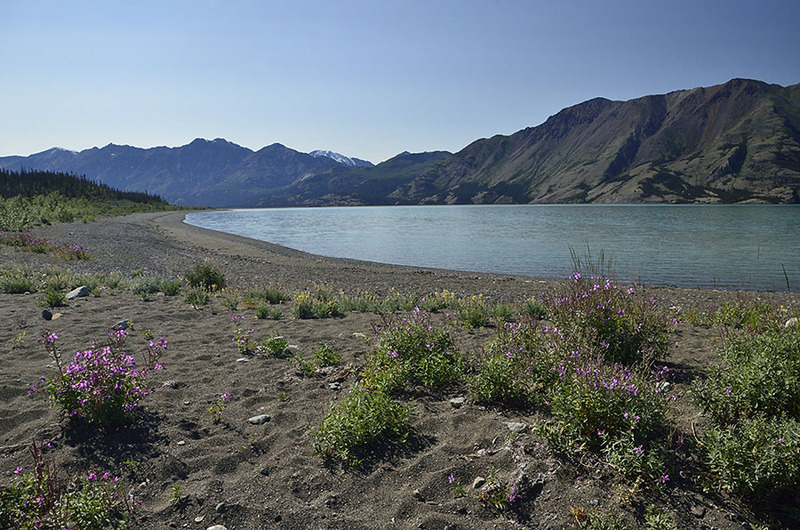 The Canadian border is very close to Haines – less than 40 miles, and the landscape changes so much as you drive over the mountain pass, through a little piece of British Columbia, and into the Yukon. It was just gorgeous. 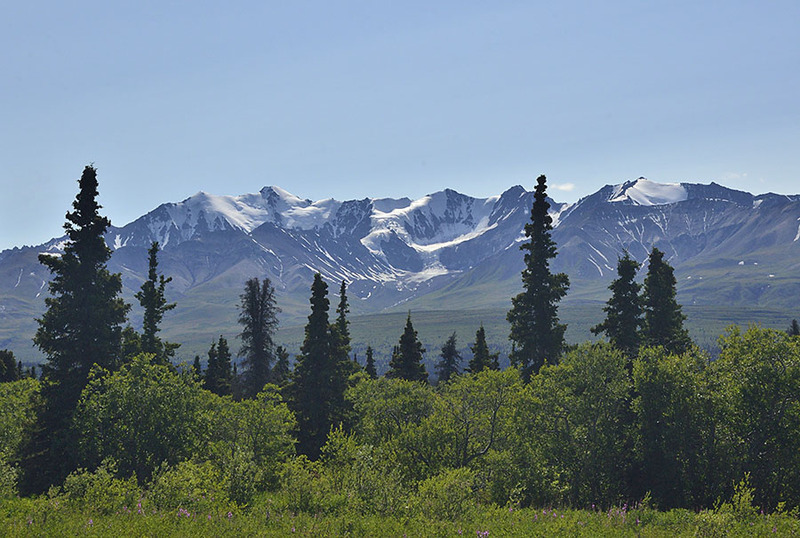 This wilderness is protected as part of Canada’s Kluane National Park, as well as a BC park and the adjacent Wrangell-St. Elias National Park in the main part of Alaska. It’s the largest protected land mass in the world, and from the little we got to see it deserves all the protection it can get. 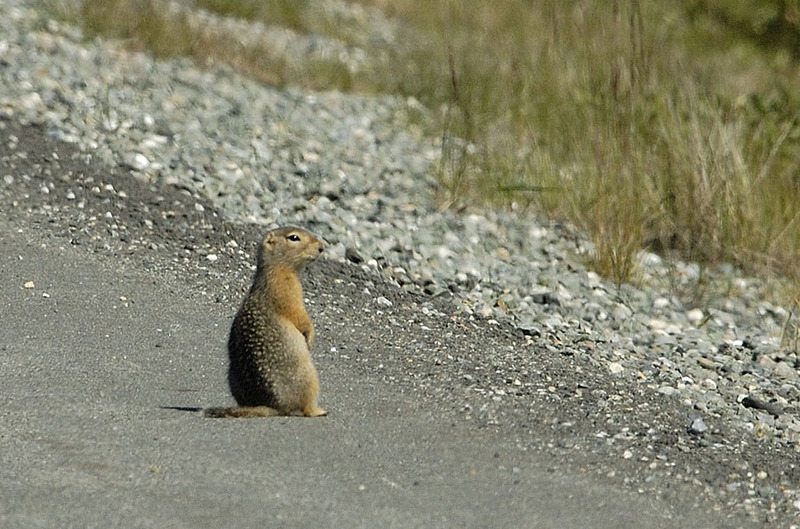 We encountered these adorable little arctic ground squirrels on the Haines Highway, particularly numerous in a 10 mile section of meadow in the high plateau. 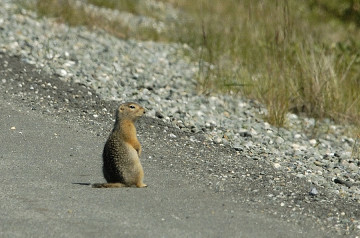 We thought they were very cute until we learned that they tend to try to cross the road just as a car is zooming by, and they occasionally get indecisive in the middle of the road. We went from being enchanted by them to being terrified of hitting one… and thanks to Jim’s quick reflexes we missed even the most suicidal of them. 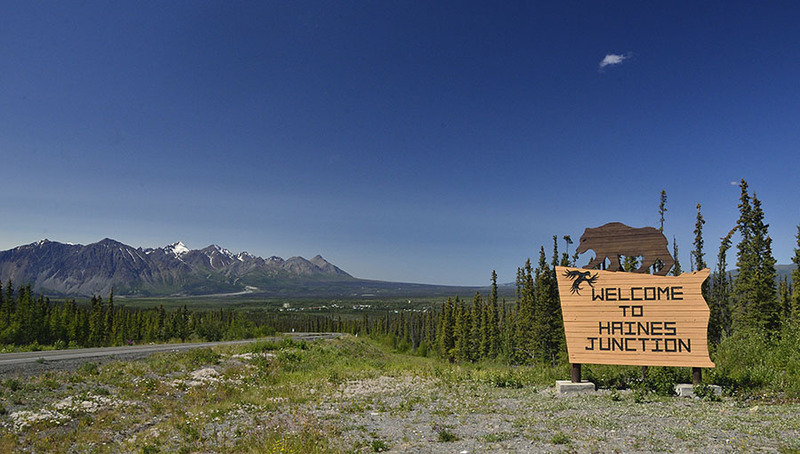 We drove up the Haines Highway to the tiny town of Haines Junction where it intersects the Alaska Highway (formerly called the Alcan Highway) in Yukon Territory. From there we headed west for a while, though one RV fellow warned us not to go too far or we would be in a long stretch of no-man’s land. 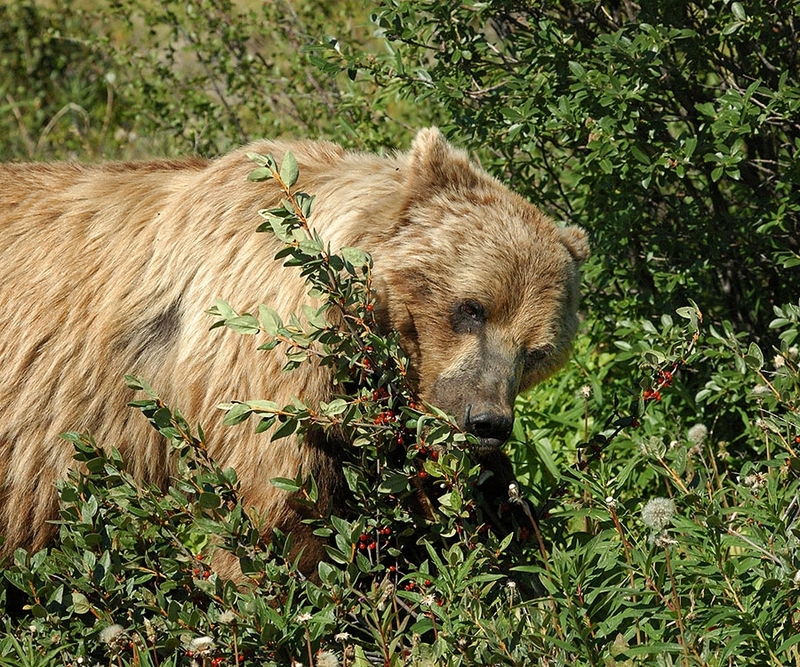 Shortly after we turned around to start heading back we spotted a nice brown (grizzly) bear in the brush off the side of the road, busily eating berries. Jim stopped the car and backed up, and the bear didn’t seem to care. We were able to get fairly close to the bear standing on the shoulder of the road, and he rarely looked up. 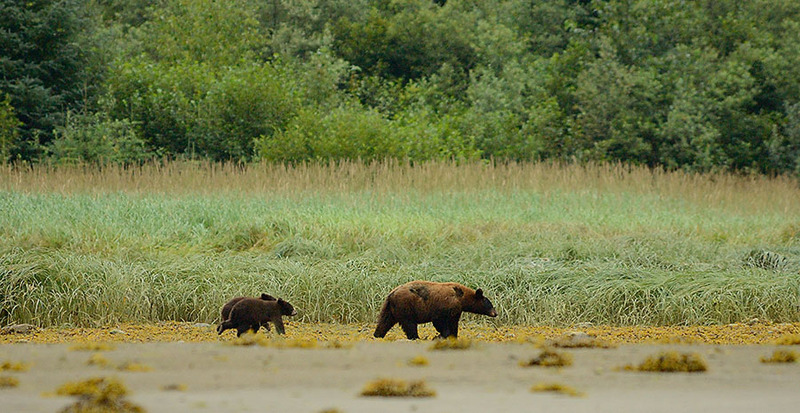 Summer is the time to fatten up for the long cold winter, and the bears up here don’t have the luxury of salmon like the coastal brown bears do. 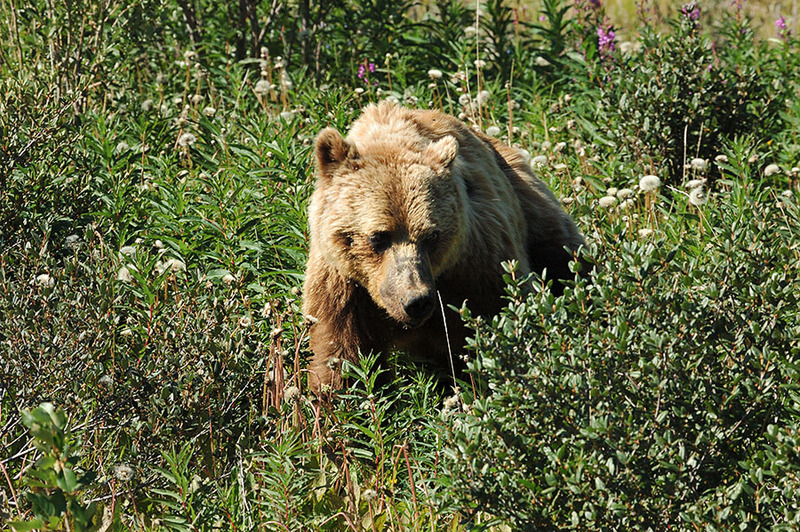 Actually it was hard to get a good photo of the bear because he kept his head stuck deep in the berry bushes. We hadn’t seen much wildlife all day – the grand landscape was more than enough to make us happy… but the close bear sighting was a real bonus! 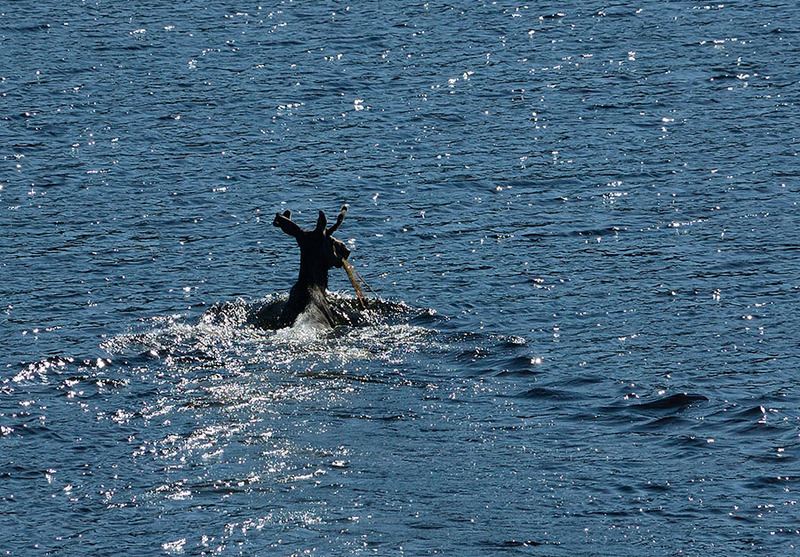 And just as I was saying “gee, now I only wish we had seen a moose today…”, Jim pulled the car off to the shoulder and pointed down at a pond below us – voila, a moose. The sun was getting low and the light was tough for photography, but seeing the moose was the cherry on top of the whole day’s adventures. 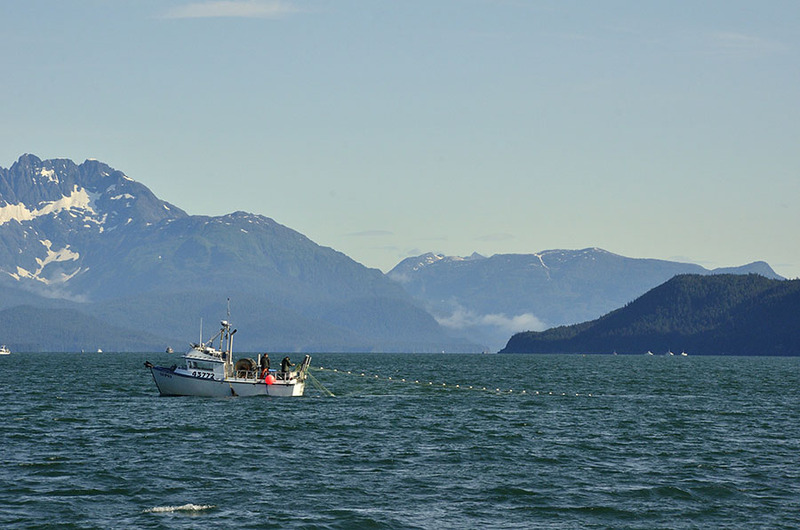 We arrived back in Haines after poking around the Chiklat River on the way, and we were greeted by a nice view of the harbor and mountains and our boat waiting for us. We couldn’t have asked for a more perfect adventure for our first time in the Yukon.